As the parent of a young man on the autistic spectrum with learning disabilities, I have developed a considerable interest in human rights issues over the years. I am always on the look out for opportunities of becoming better informed about human rights, about the current legislative framework, and about current political debates in human rights. Equally important to me is the opportunity of joining in discussion with others who are seeking to root human rights with best practice in different fields. 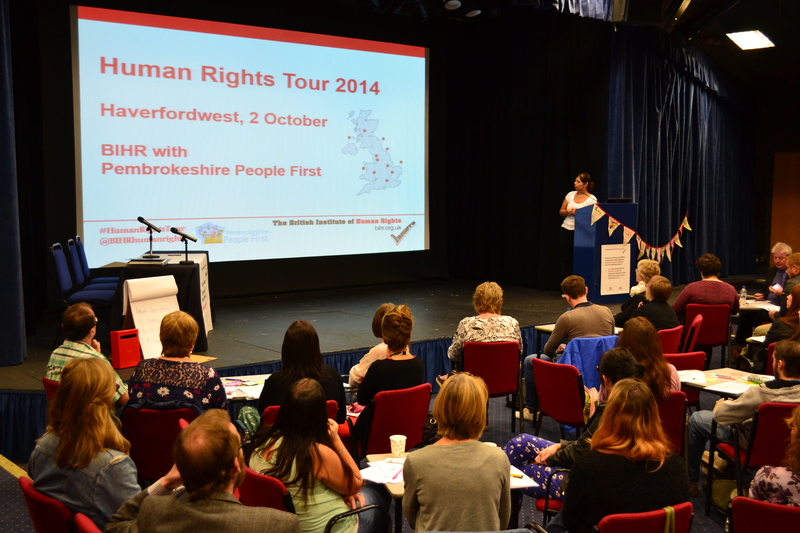 I was therefore delighted to attend the British Institute of Human Rights roadshow in Haverfordwest in Pembrokeshire. What was particularly striking was the collaboration between BIHR and a local organisation, Pembrokeshire People First. The venue was attractive – and in an accessible location! Everything was brilliantly organised and clearly presented, together with very appropriate supporting materials. The whole conference held my attention throughout the day. I would recommend the roadshow both to those with existing knowledge and experience in the field of human rights, as well as those who feel that they need to gain basic knowledge of the subject. Here in Wales, we often feel a disconnect between local experience and the work of ‘London-centric’ organisations. I really admire the way in which BIHR has taken Human Rights on the road, showing us clearly the links in the chain that runs from Strasbourg via London and Cardiff, to local communities here in Wales. So often human rights get negative coverage in the press. We were reminded in this conference that the Universal Declaration of Human Rights in 1948 and the European Convention on Human Rights in 1953 are among the great achievements of the post-war generation as they reflected on the violations of human rights by the Nazis. Those achievements are a heritage to treasure, and live by today. One of my favourite quotations is from Eleanor Roosevelt: “Where, after all, do universal human rights begin? In small places, close to home – so close and so small that they cannot be seen on any maps of the world. Yet they are the world of the individual person; the neighborhood he lives in; the school or college he attends; the factory, farm, or office where he works. Such are the places where every man, woman, and child seeks equal justice, equal opportunity, equal dignity without discrimination. Unless these rights have meaning there, they have little meaning anywhere. Without concerted citizen action to uphold them close to home, we shall look in vain for progress in the larger world.” The BIHR roadshow took human rights close to home, and reminded those of us who live in West Wales of the way in which our rights here are set in the larger world. 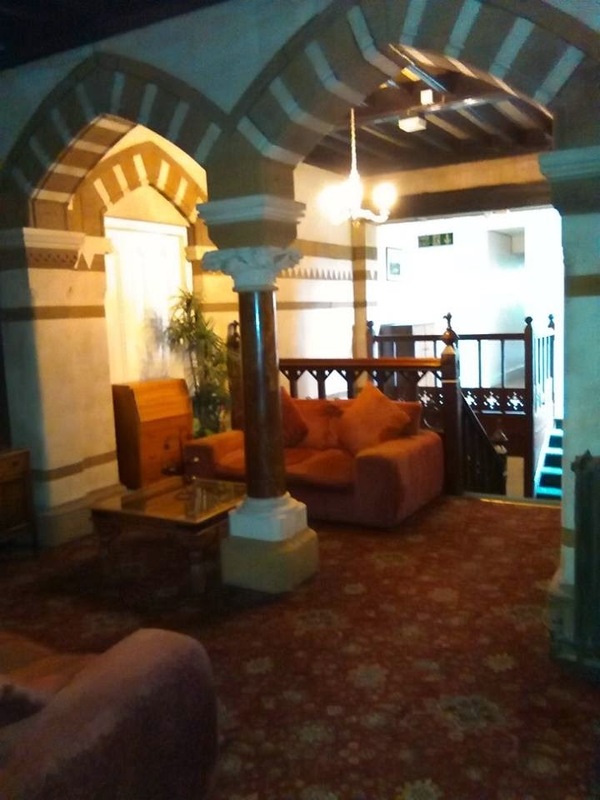 Today, Northamptonshire Rights and Equality Council were supporting partners to the British Institute of Human Rights countrywide tour with an event hosted in the Cheyne Walk Club in centre of Northampton. An audience of over forty people gave up a whole day of their time to debate, discuss and engage with the concept of human rights in twenty first century britain and aboard. The Human Rights tour has been taking place since 2011 and for the first time it had arrived in Northamptonshire. With a wide range of information about human rights including detailed description of the background to the establishment of the human rights and the framework of rights, the sessions covered case law, the balance of absolute and non absolute rights. There was a wealth of information delivered in an approach that could only be described as extremely user friendly. It was really positive talking with others in the break at the event at a time where human rights has been hitting the headlines with both the media and the breadth of the political classes having their say. The trouble is that we are all too comfortable to accept human rights as an idea that should be upheld in a far off foreign land. For right here and right now, human rights doesn’t have a poster boy or poster girl that we can all relate to as it is about all humans many of which we will never really share a similar experince with. Much of the time arguments of social justice promote the concept of “that could be you … so support their cause”. Much of the time human rights battlefields require supporters to support causes that they will never experience, so tha support has to be there with the argument that “this is the right thing to do”and the human rights cause, particular in these times desparately need you and many others to do the right thing. On Tuesday September 30, the British Institute of Human Rights kicked off its fourth Human Rights Tour with a pop-up event in Cardiff’s Butetown Community Centre, organised in partnership with Age Connects Wales. What are human rights and where do they come from? What is the Human Rights Act, and how does it apply to UK and European law? 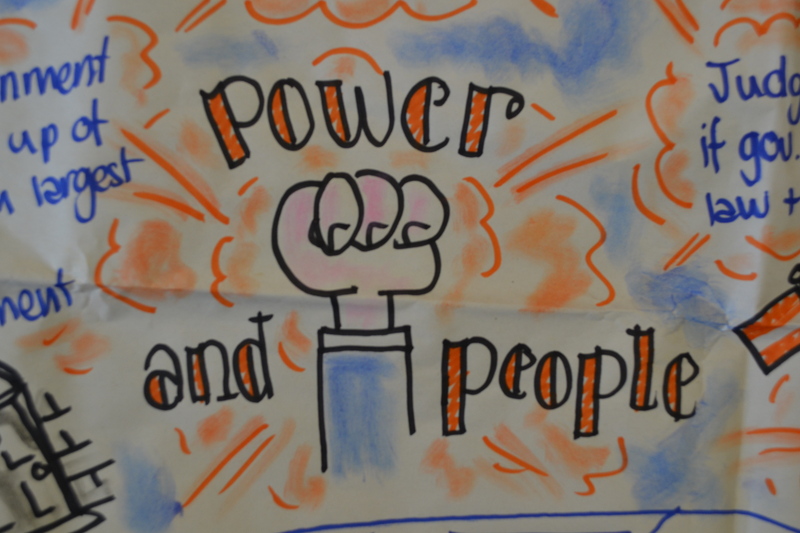 How can we identify and address human rights issues in our local communities? What do our politicians think about human rights? These are some of the questions explored by the group of students, carers, advocates and charity workers in attendance at the Cardiff pop-up. A mix of presentations and interactive sessions led to lively discussion of human rights law – as well as some eye-opening realisations about how politics and the media affect human rights in the UK. 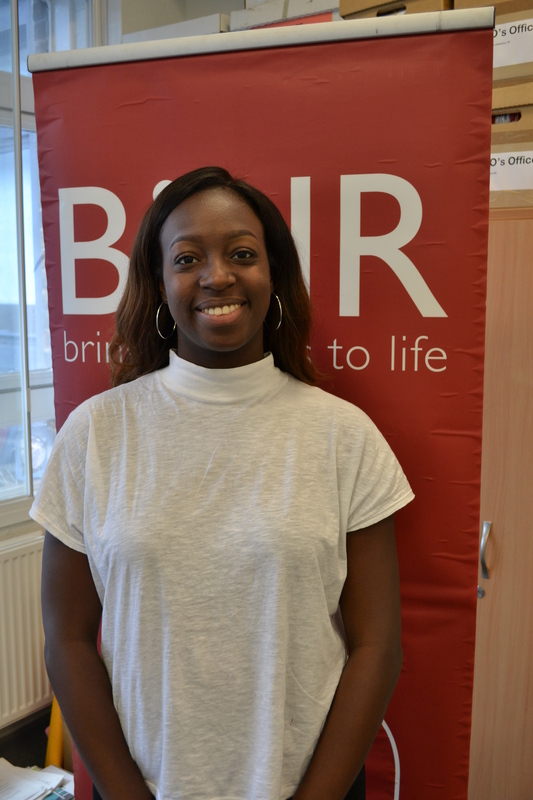 Erika Bithell, a law student at Bangor University in North Wales, was surprised by what UK politicians had to say about human rights, presented by the BIHR team in a slideshow featuring quotes from the major political party leaders and other MPs. During the morning session, participants worked in groups to examine several case studies inspired by true events, using the Human Rights Act 1998 to determine whether there had been a breach of rights and who was responsible in each case. Hawkins first got involved with the Human Rights Tour last year, signing up to be a human rights champion after attending a local pop-up event. He was then inspired to engage his organisation more from a human rights perspective, and to help host this year’s event in Cardiff. 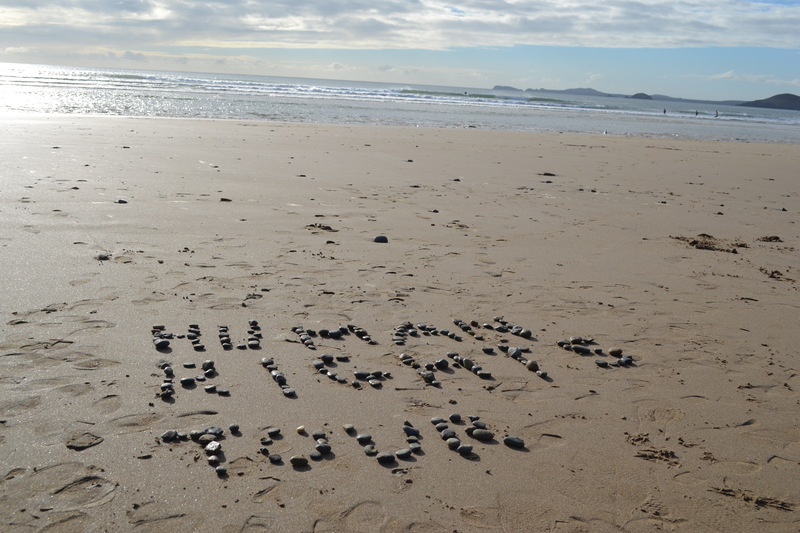 “When we got the opportunity to partner with BIHR to organise and promote the tour this year, we jumped on it,” said Hawkins, who believes Wales is in a uniquely advantageous position for human rights advocacy and awareness. Age Connects Wales is a network of 5 independently constituted organisations working to change attitudes towards ageing, improving the lives of older people by working directly with communities to address social and cultural stigma attached to ageing. Each pop-up event is hosted by local groups and public sector partners to keep each event grounded in local issues, such as mental health, “We’re keen to support more specific human rights work, particularly with older people,” said Hawkins. The Older People’s Commissioner for Wales, Sarah Rochira, spoke to attendees on Tuesday about the importance of advocacy in making sure those who fought and died for the rights we have today have their own rights respected and upheld as they grow older. “I know I wouldn’t be here, as a woman and as Commissioner, if it weren’t for those who fought and died for my rights,” said Rochira, who took up her post as Older People’s Commissioner for Wales in 2012 having spent over 25 years within the public and third sectors in Wales, working for equality and diversity, organisational development, training and education programmes within a number of NHS services. Many who attended Tuesday’s event work with care services. 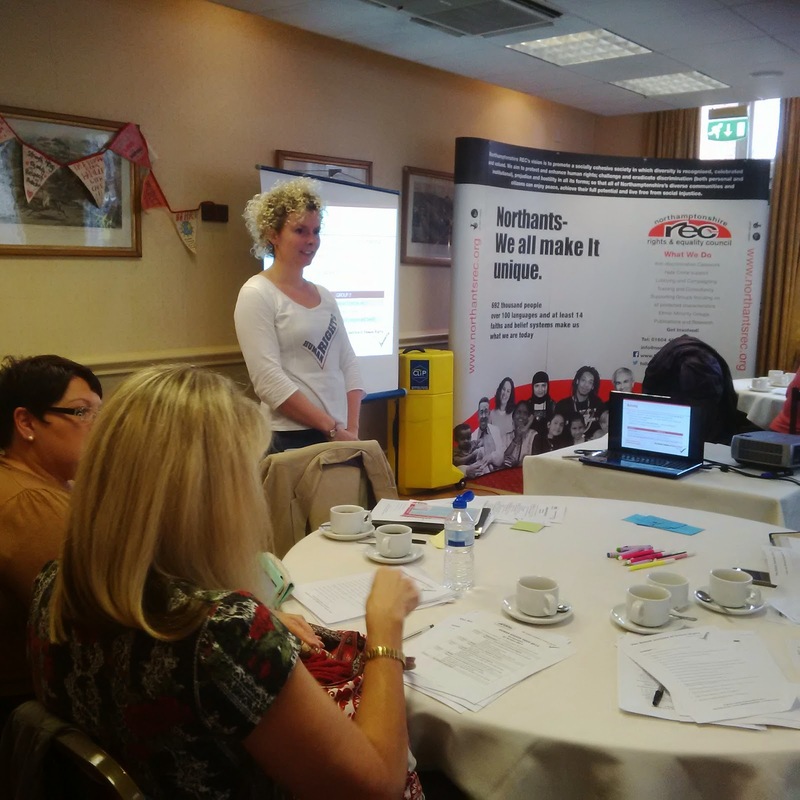 Jen Sissons attended the event with her colleagues from Age Connects Cardiff. “The tour was a fantastic opportunity to learn more about our human rights in the UK, discuss the issues surrounding human rights and gain confidence in challenging decisions concerning someone’s human rights,” Sissons said. “It would be great if they involved more local MPs in future events, too.” [Note from Editor: local politicians were invited, but none could attend]. The Human Rights Tour is set to continue throughout October and November with events in 11 other UK cities – click here to find an event near you. Places are free but limited, so sign up now! The BIHR has already had more than 800 sign-ups, and expect to see those numbers hit 1000 by the end of the tour. Last Thursday and Friday, BIHR made a guest appearance at the Wales Observatory on Human Rights of Children and Young People. The conference was titled “Rights Here: Right Now” and it was just that: two action-packed days of awareness-raising on children and young people’s rights in Wales. It was extremely well attended by academics and practitioners as well as children and young people who helped organise and facilitate the conference. Apart from the BIHR workshops, the workshop hosted by the Funky Dragon (the Welsh Children and Youth Assembly) was probably the one which I enjoyed most. Due to a withdrawal of funding, on September 30th the Funky Dragon will cease to exist. Understandably, the sadness in their faces turned to tears by the end of their 45 minute presentation, leaving us all with a sense of remorse and gratitude for their achievements over the past 12 years. 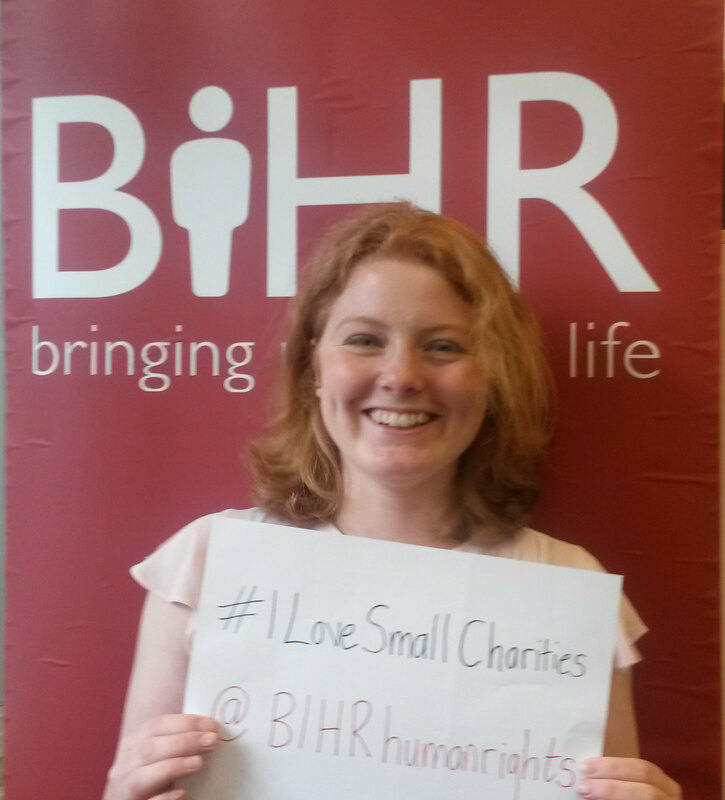 On a brighter note, both BIHR workshops were a success. The sessions focused on the Convention on the Rights of the Child (CRC). On Thursday, the young people in attendance were put to the test in a series of CRC quiz lightning rounds. Each round was a little bit harder than the next. We kicked off with questions about the articles in the Convention and ended with questions on who the major players are in the protection of the CRC. The chocolate prizes that were up for grabs facilitated a fierce but friendly competition. It was a pleasant surprise to see how much these young people actually knew about their rights and the processes which surround the Convention. To top things off, we ended the day with a bit of bunting to celebrate the 25th birthday of the CRC and its poll position as the most popular human rights convention in the world! The fun continued at Friday’s workshop with an even greater turn out. G raphic facilitator Ramon Carr joined us at a workshop titled “Map my Rights: A Forward Strategy for Wales”. 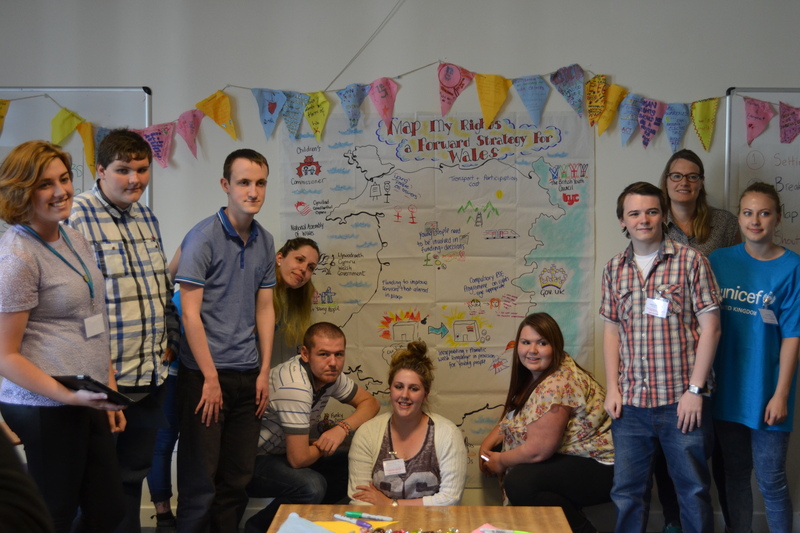 Each team was tasked with producing a list of recommendations for the Welsh Government on how they can protect the rights of children and young people The teams were also asked to suggest ways that the Welsh government can eliminate obstacles and provide support to help engage young people’s with the CRC and the forthcoming examination (expected 2017). We put our drawing skills to the test with the aid of Ramon as we transferred our written thoughts into visual representations. In between the fits of laughter, there was meaningful and passionate discussion as those in attendance shared what rights they felt they lacked as young people. The highlight for us all I think, was the presentation of the graphic facilitation from Friday’s workshop at the final plenary of the conference. Those who presented stood confidently before the entire conference as they voiced their shared opinions on what the Welsh Government needs to do next to safeguard children’s rights. It was a proud and powerful moment for everyone in the room. Whilst young people have so much to say, they are often not given the space to express it. Conferences such as “Rights Here: Right Now” offer the perfect opportunity to bring the voices of young people and children to those with decision making powers. In my opinion, if there is to be progress in the protection and execution of the CRC, more events like this one must be hosted to ensure that this gap is filled. I was lucky enough to be a peer facilitator at BIHR’s ‘Human Rights Here and Now’ event in Manchester this August. The event was extremely informative and focused on educating young people about the U.N. Convention on the Rights of the Child (CRC); what it entails, why we have one, who is involved in its creation/implementation and how we young people can get our voices heard. First, we went through the history of human rights and learned about past events that led up to the creation of the CRC. We then looked at what the CRC is, who it effects and how the CRC is protected. It was particularly interesting to learn some schools have signed up to follow the CRC. Next, groups discussed human rights in general. We did this by categorising the stages of youth into baby, toddler, child and teenager. For each phase of life young people brainstormed and discussed what rights are required at different times in your life. We found the rights of a baby were much more basic than the rights of a teenager but still crucial and fundamental, and those that applied at a young age stayed with them throughout the life of a child, for example the right to a family or clean water. We then looked at the rights in the CRC in more depth and the young people got a good idea of what the CRC actually entails. The next activity focused on the key players involved in the implementation and scrutiny of the CRC. The facilitators played the role of different key players in the process, such as charities or the government, to raise awareness of the CRC examination process within the UK. Once we had a much better understanding of the CRC, groups examined the rights and prepared a presentation on a theme they believed needed tackling, such as education, participation or non-discrimination. They then presented these to a mock committee. This was my favourite part of the event; it was fantastic seeing so many inspiring ideas presented by passionate young people. Lastly, we discussed youth participation locally, regionally and nationally and were informed about what currently exists (e.g. the BYC and UK Youth Parliament). We also discussed what people thought were the barriers to getting involved and what else may be needed to encourage young people to be active citizens. This touched on the influence young people should/could have on key decision makers. I think it’s important for organisations like the BIHR to host events like this, as educating young people on their rights enables them to be able to go about their daily life more prepared and equipped. I know a lot of useful information now and I hope to pass on what I have learnt and encourage other young people to research the CRC and gain a better understanding of what is out there to protect them. Summer holidays are in full swing and yet, on a cloudy day in August, BIHR were getting ready to host the London leg of the Human Rights Here and Now project. With funding from the Equality and Human Rights Commission (EHRC), BIHR designed three young people’s events which focused on engaging young people with their rights set out in the UN Convention on the Rights of the Child (CRC). The events provided a way to foster much needed conversation concerning young people and their rights by providing a crash course on how the Convention aims to protect young people’s rights. The day was also a great opportunity to inform them on how they could get their voices heard on the issues that matter to them. At the Human Rights Action Centre in Shoreditch there was a room filled with eager young people who had come to the event from as far as Norfolk. The day was packed with talks and activities and was accompanied by a live artist depicting the day’s events on a large canvas. After a quick icebreaker the young people were shown the articles from the CRC and this was used as a starting point to launch discussion on the rights of young people. The knowledge and energy that the young people took from the day was particularly evident in the presentations the young people made to a mock committee. Many of them, initially shaky and shy, really came into their own. For example, one young person used her experience of growing up on Traveller sites to inform her understanding of human rights. Constantly having to move because of the changing law and improper implementation, she described how many in her situation had little education or faced bullying and discrimination in schools. Another young person spoke about the lack of opportunities to participate in human rights mechanisms. How, despite events such as this, young people aren’t given a voice in human rights discussions. All of the groups spoke about a desire to improve opportunities to engage and set a goal of actual CHANGE. We then delved into a bunting making session, with many teens (and BIHR staff and volunteers) rekindling their nursery years by playing with glitter glue and felt tip pens. Yet, in the midst of such fun an important plea was made: the young people need more. Although some were armed with information that was impressive to hear, sadly many of them weren’t. Many were not clued up on what rights were afforded to them at all, and this event provided basic learning, not improvement of knowledge they already possessed. Many had issues they wanted to voice, almost all that would be helped by encouraging and facilitating their engagement with human rights discussions.